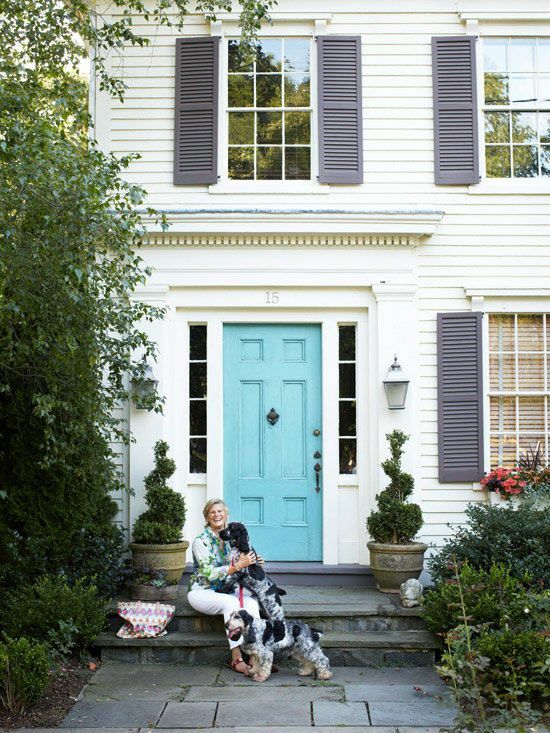 Decorative front doors are one of the simplest ways to make your house stand out. A door brings people into our house, so it will always be important technically, but it also brings people into our home, which has both social and spiritual implications. 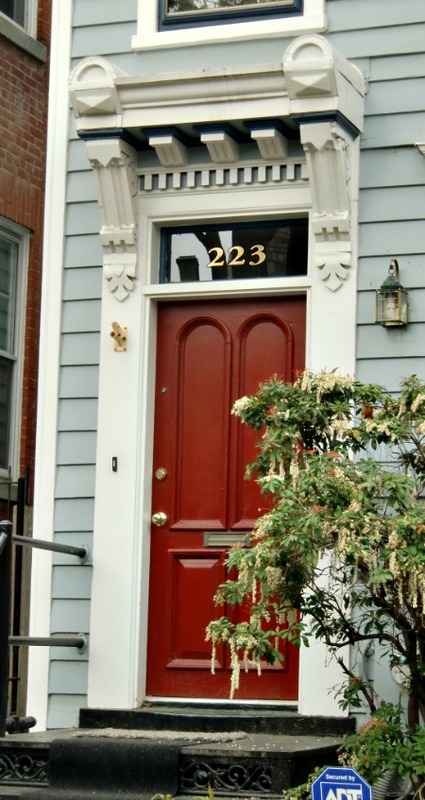 Decorative front doors become a focal point for the eye, but also send a message. “You are welcome here” is what most people want their door to communicate. It is an interesting conundrum. A door is both to keep people out, but also to welcome people in. That creates a tension, but it is a problem that man has been solving rather well for the last few thousand years. 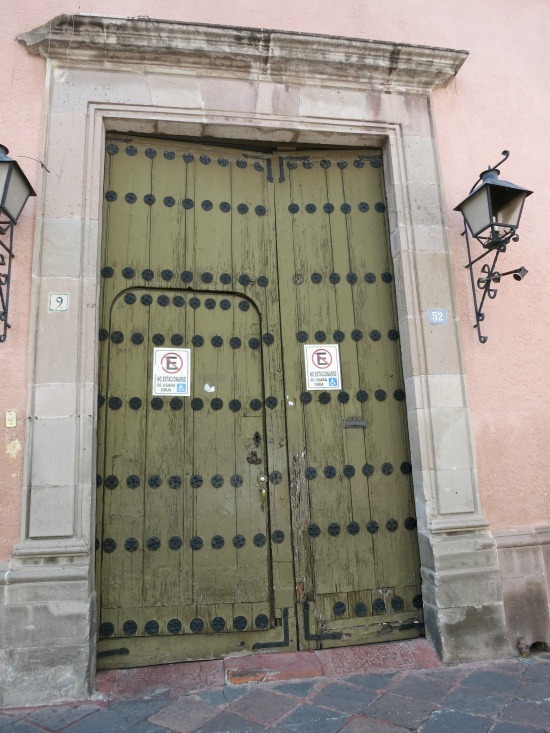 In this article I present dozens of doors that have caught my eye. An entryway can be considered as having three distinct elements. First, there is the door. Second, we have those architectural devices that frame the door. This might be sidelights, or a fan window, or a host of other decorative or functional items that define the door space. Third, there is the entry setting. Here I refer to the stoop, porch roof, and portions of the house that provide a location for the doorway. An entry door is usually a stout affair, strong enough to repel thieves, with solid locks, and well-insulated against noise and the cold. 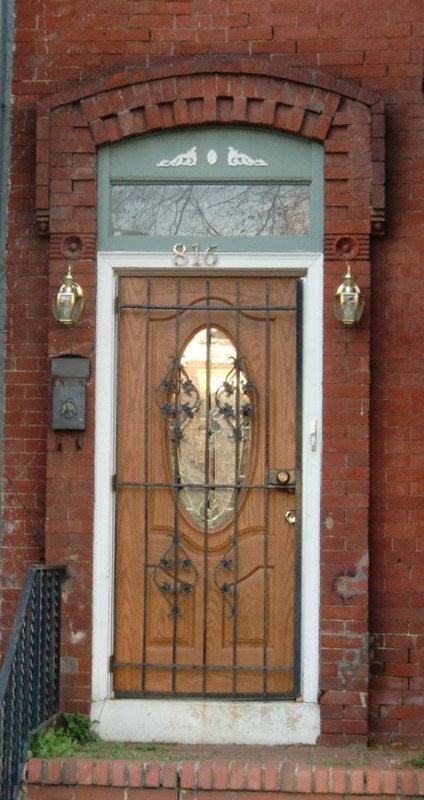 Beyond these basic functional aspects a front door is often a work of art, or at least craftsmanship. 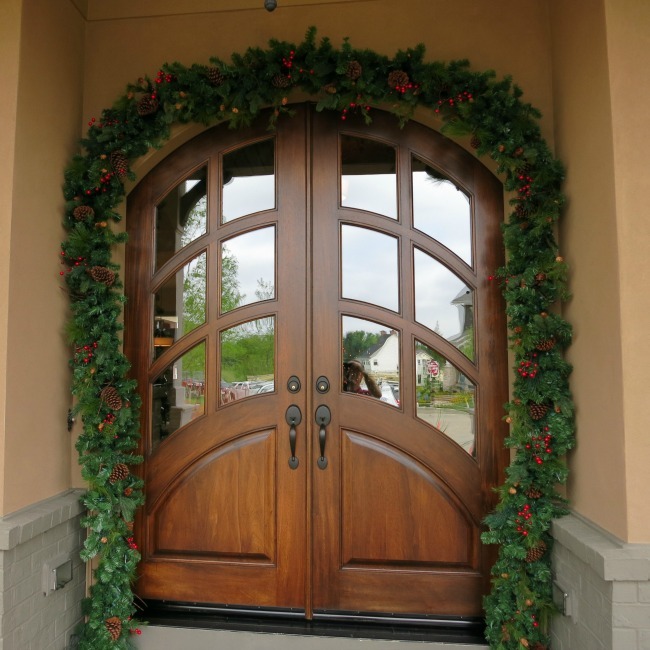 There are five basic decorative aspects to decorative front doors. Color, texture, hardware, shape, and the presence, or absence, of windows within the door. A sixth would be the addition of decorative items, such as bows and wreaths, which are not an integral part of the door. I will leave this sixth category for someone else to discuss. 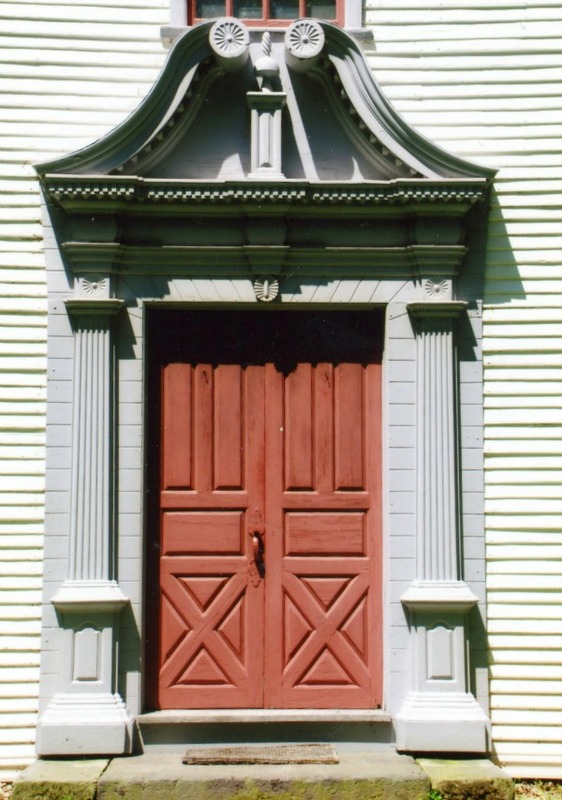 Color, for most decorative front doors, is the easiest to change, and the subject of many an article. A door is such a distinct element that it almost begs to be highlighted with a contrasting color, and many a homeowner does just that. Conversely, doors are associated with wood, so a natural stain, with shellac, is often used. Whereas with the rest of the house homeowners will restrict themselves to a limited number of complementary colors, with the door they often let their imagination run wild. While this sometime turns out to be disastrous, the cure is easy enough. Another coat of paint and you move on to the next color. 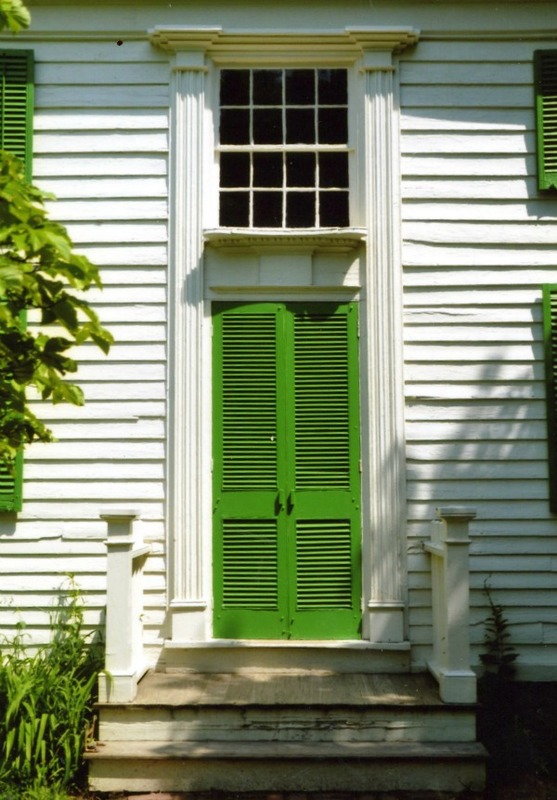 I am leery of green doors, green shutters, and green houses, but some people have an affinity for the color. 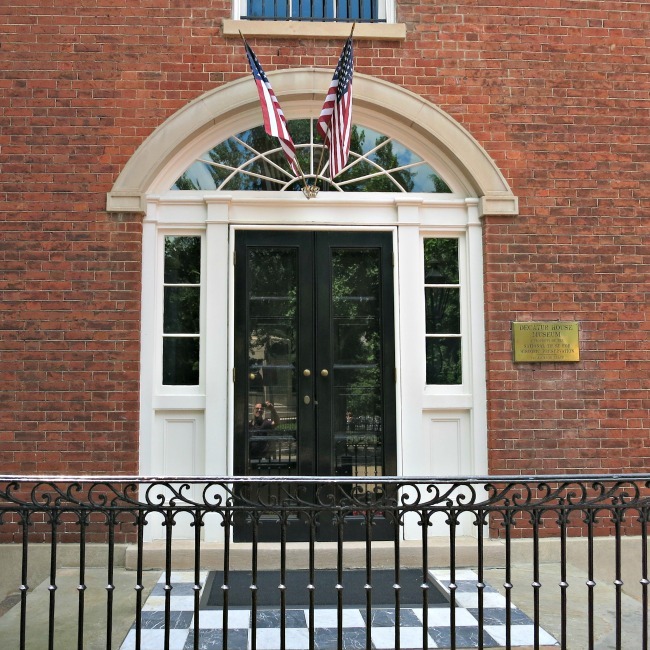 The louvered shutters on this door were the equivalent of 19th century air-conditioning. Another door is hidden behind the green door. Tying the window and the door together with pilasters provides a strong division of the house. 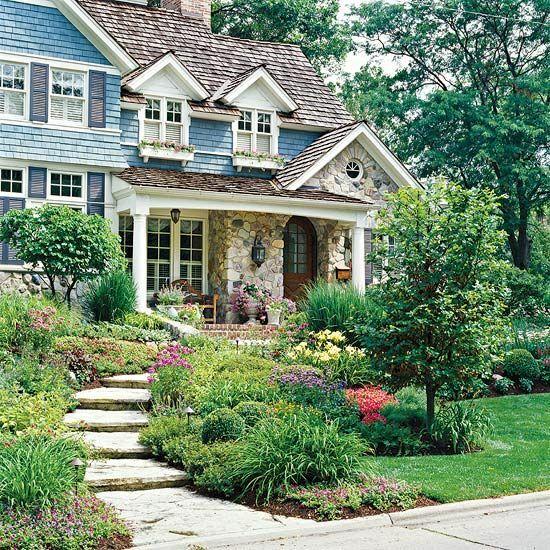 This is a very unusual application of pilasters and makes for an atypical Colonial. Photo courtesy of Peter Joel Harrison. The color you choose will say a lot about your home. 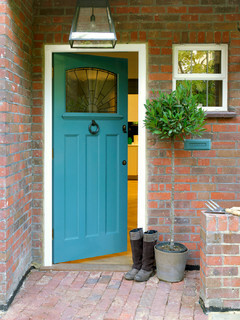 The soft blue on this decorative front door is relaxing and evokes a feeling of harmony. The surface of decorative front doors can be plain and flat, but more often they are panelled, or at least they simulate panels. Wood panels were the carpenter’s way of making a door relatively light. In the process they discovered that the panels could make for interesting texture and patterns. This became the standard and we have grown used to this look, so we often replicate the panels in doors made of steel or fiberglass, where the panels are functionally unnecessary. But the world of doors is so diverse and so fragmented there is no need to keep to this pattern. If your house is better served by some other surface texture, only your imagination need limit you. Of course, once you stray from the orthodox door styles the cost tends to go up, and the limits of your imagination may require hiring a craftsman to bring your dream to reality. The pattern is the story. 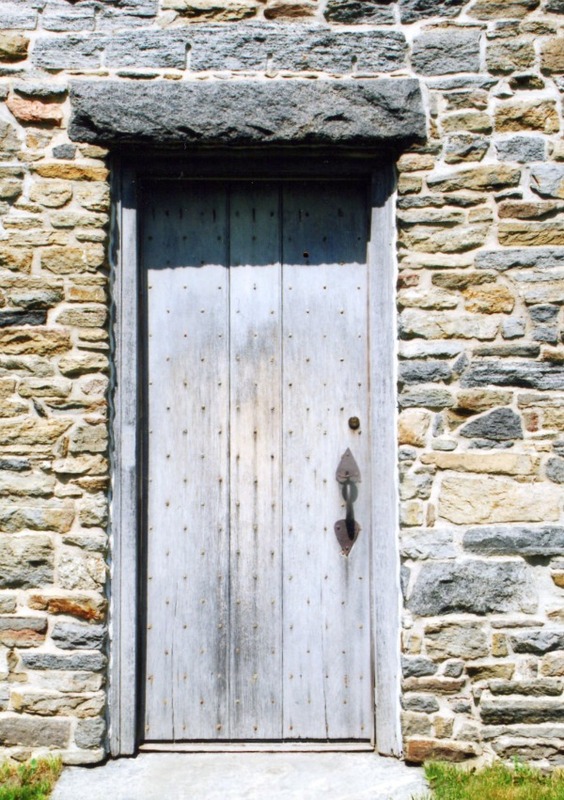 On the door on the left compare the regular array of nail heads in this simple door with the irregular shapes of the surrounding stones. This creates a counterpoint that draws our attention to the door. The door on the right has a bit of a masculine military look. The large rivet heads, in black, and spaced closely together, commands your attention. Also not the door-within-a-door. This is not uncommon when you have a massive door. Photo on the left courtesy of Peter Joel Harrison. The hinges, the door knob, and sometimes a knocker, comprise the hardware of a door. Often the designer strives to minimize the hardware. Hinges are hidden, knockers are avoided, and the door knob is kept plain and unobtrusive. This need not be the case. On the other extreme strap hinges can span the door, door knobs and handles can be beautifully crafted, and a large knocker can stand like a centerpiece, inviting you to announce your presence. Either system can work. It will depend on the door and the house. Where I live a lot of the older, fancier homes had decorative front doors which had beautiful door knobs, or knockers. 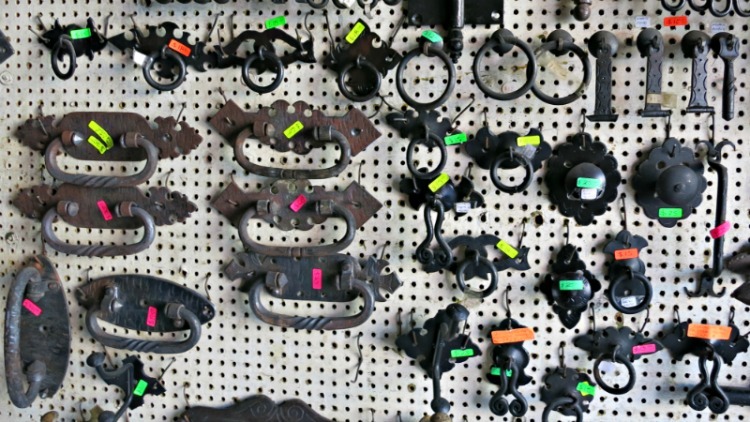 A few have ornate bell pulls. I find them interesting in themselves, but they would not work on every house. It is best to match the door to the house. Doorknockers anyone? From the serious to the whimsical anything is possible. When modern door hardware doesn't fit your need it is time to go antiquing. Reproductions and genuine antiques will cost more, but they can make the right door look perfect for its role. 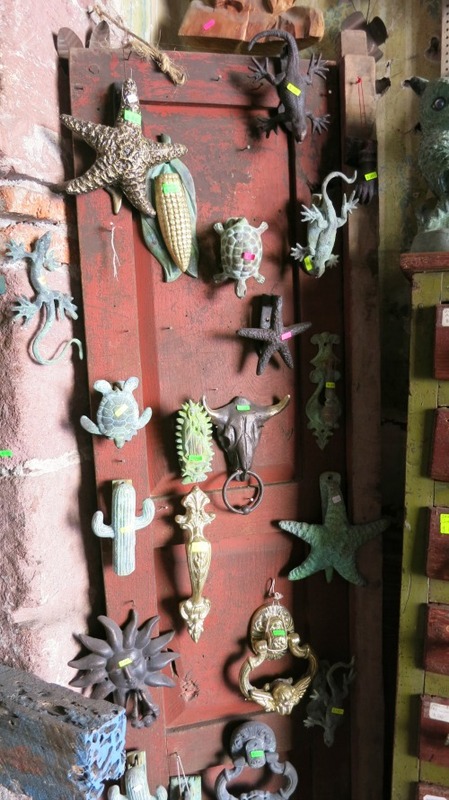 To get these particular pieces you will need to visit Mexico, but there are plenty of similar stores in the U.S. and, thanks to the internet, you may not need to leave your house to find the perfect hardware. 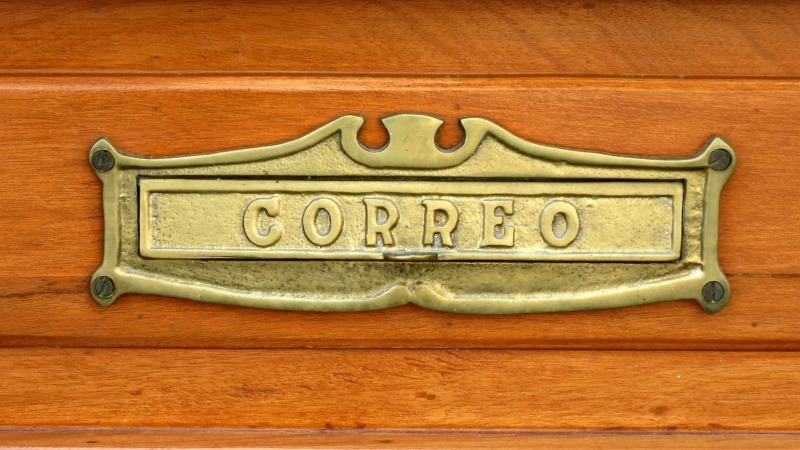 A mail slot used to be a common feature on decorative front doors. If you have a mail slot, you might as well make it look good. Here a sturdy casting provides the frame for the mail flap. Shape is an element we sometimes forget about. Almost all doors are some variation of the rectangle, yet decorative front doors can be arched, round and even asymmetrical. Hobbit doors are round, and the movie The Lord of the Rings has inspired many homes to aspire to the hobbit aesthetic, but these are still rare. Back at the end of the nineteenth century the Art Nouveau movement celebrate the curvy and the sinuous and some designers found clever ways to incorporate this into the shapes of their decorative front doors. Further back, the split, Dutch door was popular. In this incarnation the bottom and top halves of the door operate independently, so you can have your top wide open while keeping the bottom closed. This keeps the dogs and kids in while still inviting the neighbors to poke their faces in and say hello. It improved the sociability of the doorway, but became a casualty of improvements in heating and air conditioning and the automobile. Together these made us less likely to keep our doors open and our neighbors less likely to walk by. Today we are perhaps less adventurous than we were then, but occasional mavericks still seek to reimagine the door. The door here is actually rectangular, but the arched transom over the door blends with the door to create the look of an arched door. 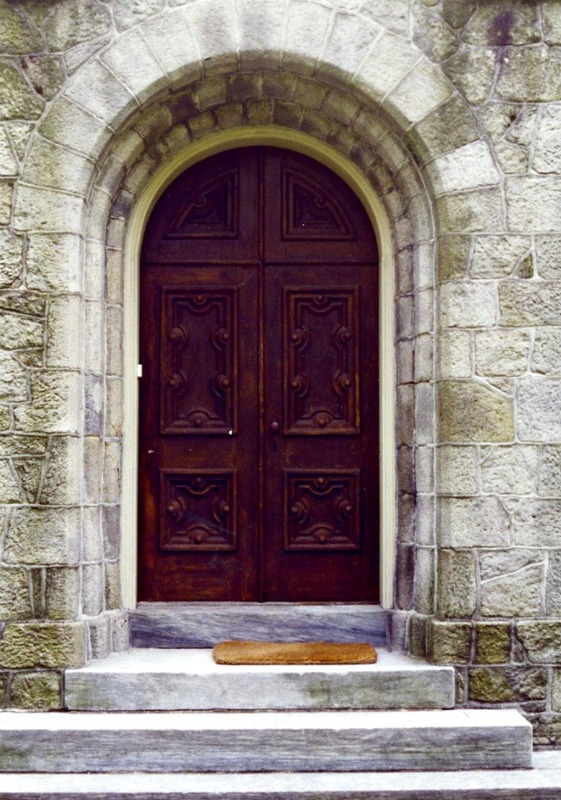 A good number of arched doors are like this. 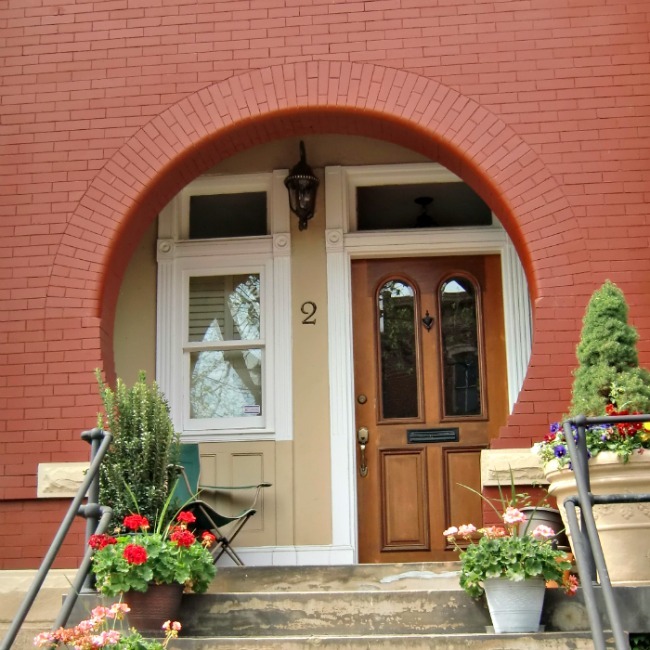 It is simply easier to build than to have an arched door fitting into an arched frame. I am including French Doors as a variant of the shape of a door. It is usually fairly easy to adapt to an existing opening, and has the added benefit of working better in tight spaces. This door also illustrates the use of individual panes of glass within a door. The resulting lattice structure provides texture, while the glass provides light. Think of this as a square door with a 60-40 split. I suspect only the right-side opens. In the U.S. it is a rare thing to see a house with a square door, but in certain applications I think it could be quite the eye-catcher. 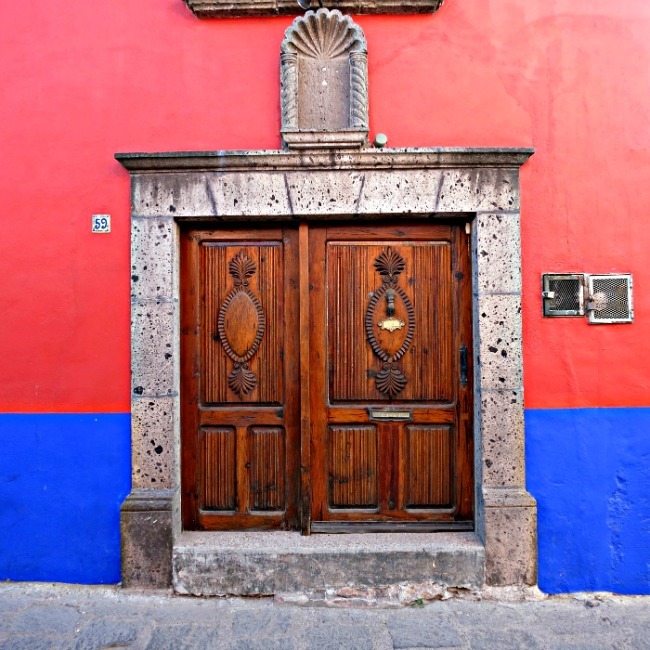 This particular house comes from San Miguel de Allende in Mexico. While a door need not include a light (known elsewhere in the house as a window) a bit of glass does provide a way to alter the looks of a door, and has the added benefit of bringing light into the house. Of course glass in a door does compromise the security. My big old glass door could be easily demolished with a hammer, but, since any thief could just as easily enter through my windows it seems a trivial point. I am less fond of lights within decorative front doors for what they do for the door than for what they do for the house. They tend to be a complicating factor when it comes to decoration, but they allow light into the foyer, and foyers are often dark and uninviting, which is the opposite of what they should be. Lights in decorative front doors are often interesting in themselves. Not only is this oval, but there is some stained-glass artistry going on here. Unfortunately the metal security gate detracts from the overall look. The wrought iron flowers obscure the door and make the whole look too busy. There is a lot going on here. French doors with glass under a glass transom light capped by an over-sized decorated lintel. I like it all except for the asymmetry of the of the white course that runs off to the left.That makes the whole doorway look awkward. Also the heavy stones up high, without any reinforcing columns below, makes the doorway seem top-heavy and unbalanced. The lights in this door reflect its shape. There is something not quite right about this door, but it is certainly one you will remember. Earlier I referred to “those architectural elements that frame the door”. From a functional standpoint most of these have no purpose. They are there solely to present the door to the public. They cry out “Look here. This is important. This is where your eyes need to be. Part of what the setting provides is scale. A door is a small affair compared to the overall structure. Add stuff around it and the doorway becomes much bigger, so that it can stand without seeming to be dwarfed by the house. Side and top lights are often employed this way. They make the door space much larger and act like a border around a picture. Molding exists to cover up the transition between the siding and the doorway, but is often amplified in its role to act much like a frame around a picture. 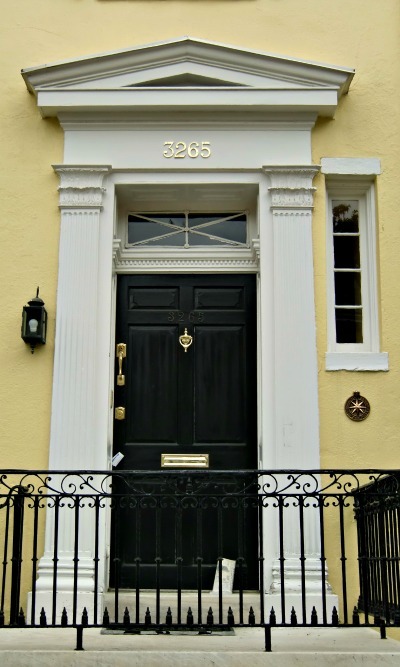 For most doorways this is all you will have to highlight your door, but in houses with a classical bent a headpiece consisting of a broken pediment will often crown the doorway. In the wrong setting these can look pretentious and overwhelming. Even in the best settings there is a touch of arrogance to such a flourish, but they point the way to what can be done to further glorify what is the humble function of the door. This keyed arch provides a simple but dramatic setting for this decorative front door. The door retains the earth-tones of the stucco while still being a dramatic counterpoint to the light, yellow walls. The arch, the fanlight and the sidelights all set up the door, although in this case the door itself is anti-climatic. The black suggests a void rather than the presence of a door. Here a more dramatic door would be in order. This door gets the full Greek Temple treatment, complete with a full-sized architrave and pediment. 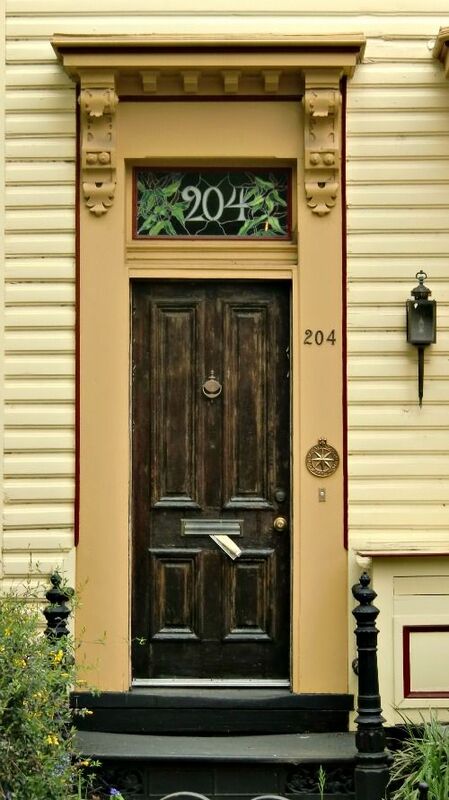 The black door avoids becoming an abyss of color thanks to the brass hardware. If Classical isn't your gig, consider this variant of Gothic tracery applied in an eclectic fashion against the rough-hewn lintel. The door is plain, but the setting is amazing. Here is an interesting twist on a classical doorway header. I wish I could remember what the rest of the house looked like. I bet the same brackets and corbels were used on the eaves. This door needs to be replaced, but I wanted to speak a word about the transom light on this and other doors in my collection. 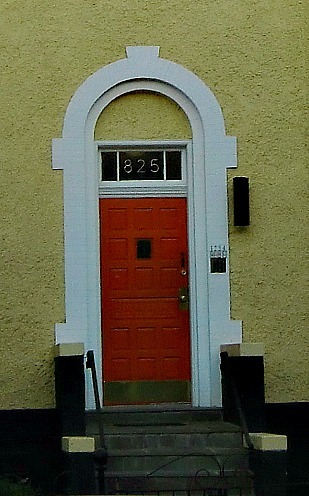 In Washington, D.C. it was quite the fashion to display the house numbers on the window above the front door. What a great tradition! It is easy to see and will shine out at night, when numbers are usually least visible. This split pediment has a baroque curve to it. The baroque period saw the introduction of curved surfaces to classical element, and a tendency towards over-ornamentation. Here the curves on top contrast with the straight lines of the pilasters. 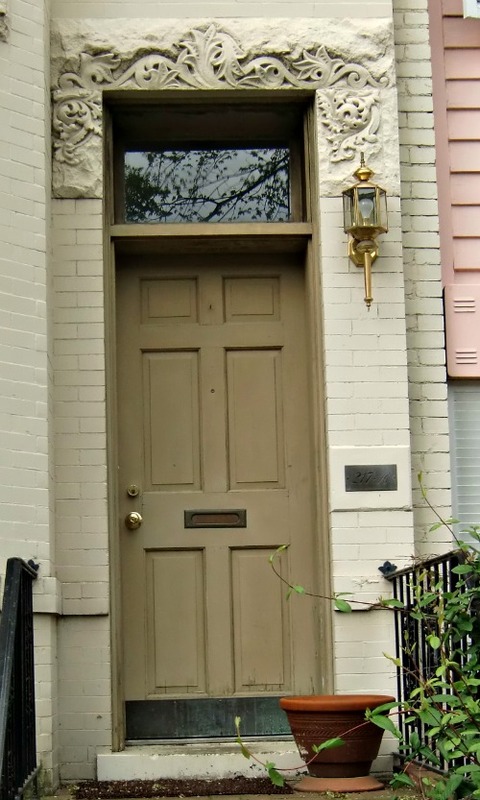 This type of door treatment was common with Georgian and Federalist homes. 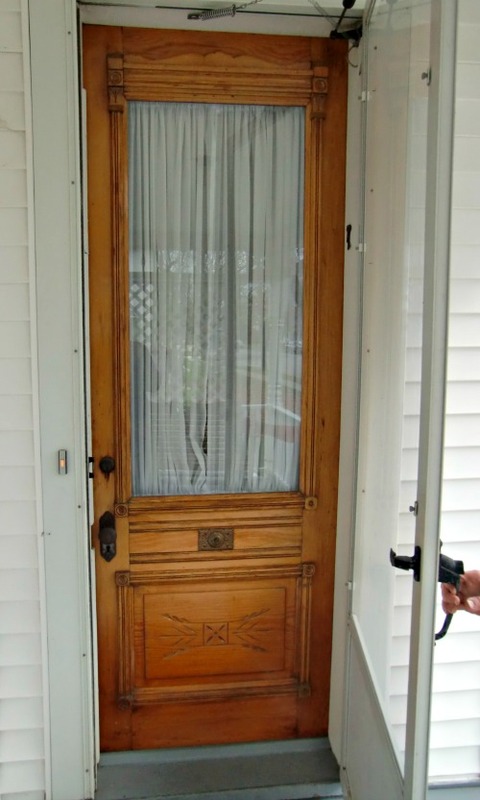 When Colonial Revival homes became popular this type of doorway also had a resurgence. 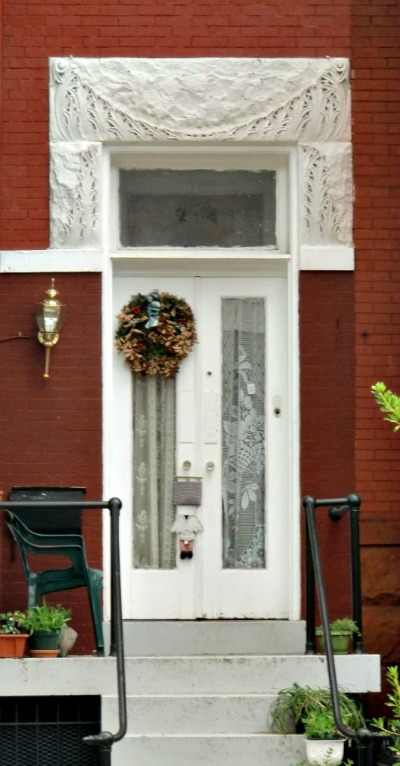 Decorative front doors rarely stand alone. From a purely functional standpoint it makes sense to provide some space in front for people as they wait for the door to be opened. Often there is a need for stairs, to bring pedestrians to the level of the first floor. Out of courtesy a small projecting roof is often extended to cover the waiting guests. Sometimes this all takes place within the larger expanse of a front porch, that exists in its own right, but for many a doorway these other elements exist solely to support the door in its role. Decoratively these elements provide context for the door. At their best they show off the door, and make the doorway seem pleasant and inviting. In less successful applications they conceal the door in shadows. Sometimes, they add to the tension of visitors. A doorway that does not clearly tell a visitor where to stand can make him feel awkward as he considers whether he is intruding in some private space. A round door would have been a nice touch, but it is not really necessary with this round opening making such a dramatic statement. This clearly defines where a visitor should stand, provides a nice transition zone and protects him or her from the elements. Best of all it looks awesome from the street. Take a second look at this photo. The door is actually recessed several feet behind the columns. There is a small entry porch between the large columns and the door. This type of recessed entryway allows you to provide protection without cluttering up the front of the house or intruding into the sidewalk space. 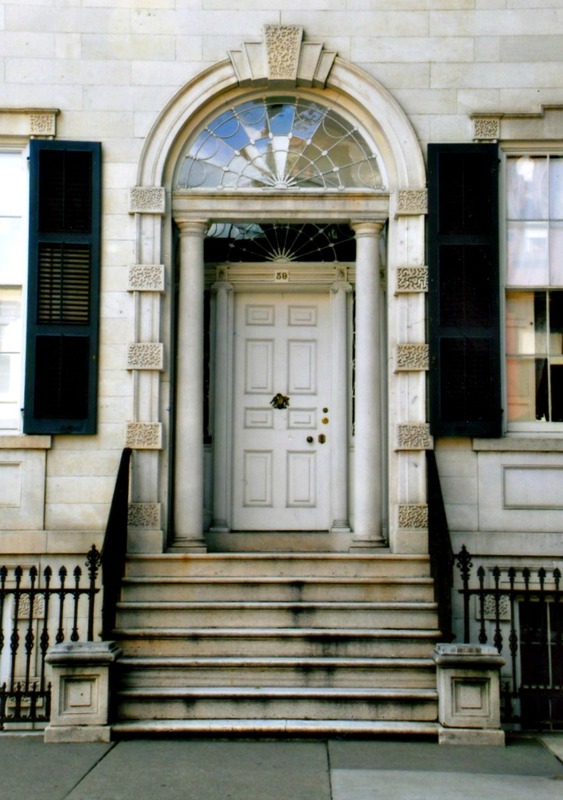 However, creating such a transition zone adds a complicating factor to our study of decorative front doors. A doorway should stand out, so you know where to go, and because it is a natural focal point, but a transition space will often tend to conceal the doorway. In the extreme, something like a walled courtyard simply pushes back the entrance to the private space. Rather than being at the front door it is now at the gate. The door is concealed and the gate now becomes the thing that you decorate. This defeats the purpose of a transition. Rather the transition zone should be something inviting and clearly not within the private space of a home. I have often had awkward moments when I needed to get to a door, but a garden gate and thirty feet of walkway stood between me and the door. Should I simply open the gate and walk in? Should I shout out a “Hello” before entering? This is a transition zone that has failed in its role. And yet, too open a yard, devoid of any boundaries, becomes too public a space and also fails as a transition zone. It is this type of tension that makes architecture so difficult, why if fails so often, and why it is such an interesting challenge. Yet the reward for good architecture is a home livable and loved and welcoming to all. 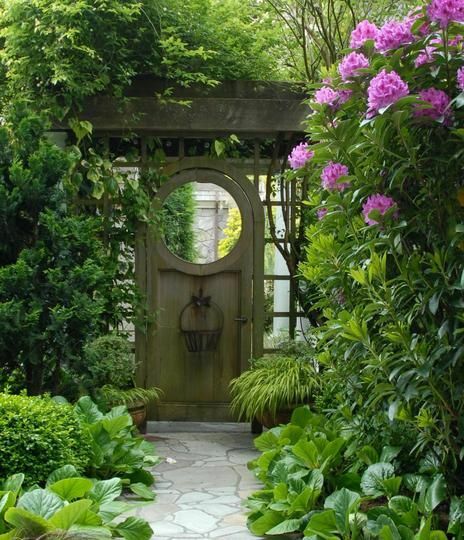 This garden path prepares you to enter the house. It is clearly taking you to the entrance and yet its indirect approach invites you to enjoy the flowers along the way. Most are photographs I have taken. 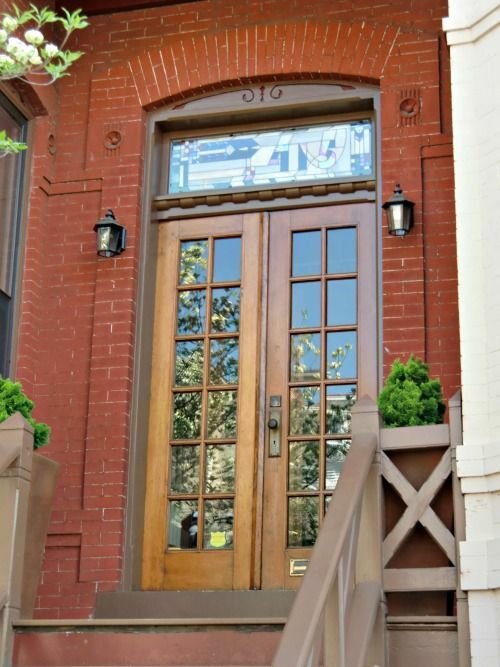 Several of these are from Washington, D.C., which is a city of beautiful doors. Several of the photos have been shared with me by Peter Joel Harrison. He creates pattern books with his drawings, showing how others have met architectural challenges. Two of his books, American Doors and American Windows, are coming out soon from Bauer & Dean, publishers. Some of the photos have come from commercial sites off of the internet and are so marked.